Will high-speed rail reduce greenhouse gases? The American Public Transportation Assn. helped organize a practicum – that is, discussion – on high-speed rail in Los Angeles on Thursday. 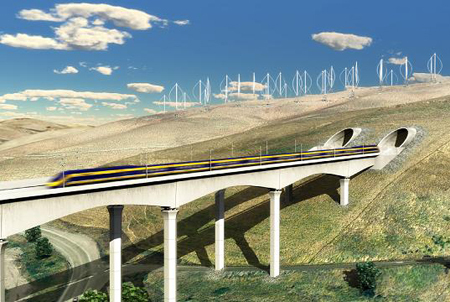 The idea was to bring together some experts and state officials to discuss the challenges of building high-speed rail both here in California and other states now that the federal government has handed out $8 billion in grants for 13 projects around the country. In a Q&A with the media, a good question came up – something, in fact, I’ve been curious about. The reporter wanted to know why California had chosen to build a full-fledged 200 mph-plus bullet train instead of upgrading Amtrak service, a less-costly measure embraced by other states. Rod Diridon, a board member of the California High-Speed Rail Authority, had this answer: the decision was made some time ago that in California the goal should be for high-speed rail to compete with short-hop airlines, which he called the highest emitter of greenhouse gases that cause global warming. In order to compete with short-hop airlines, it was determined that California would need trains that would run in excess of 200 mph – a speed far higher than a regular Amtrak train could achieve even with significant upgrades. That’s why the goal of the high-speed rail project is to travel between Anaheim and San Francisco in a little more than 2.5 hours, a time seen as competitive with flying between the two cities plus time getting to and from their respective airports. As it happens there has been some vigorous debate among academics and other experts about the benefits of high-speed rail when it comes to greenhouse gas emissions. Most people agree that bullet trains running on electricity produces far less emissions than an airplane, although some have argued that those benefits are somewhat erased when emissions from construction are factored in. If you’re interested in this topic – yes, it’s wonky but it’s also important – I wanted to point you to a couple of interesting blog posts on the New York Times website. In the first, from the Freakanomics blog, the point is made that high-speed rail is cleaner. But citing research done on two proposed rail lines in Britain, the blog says that actually lower emissions depends on the trains’ ability to capture significant numbers of former airline passengers. The second post, from the Economix blog, finds that there likely considerable environmental and human benefits from high-speed rail (i.e. people would be safer on the train than if driving). The question, the blog poses, is whether the greenhouse gas emissions achieved are worth the enormous cost of building a system. Of course, no one can really predict the future. A high-speed rail system, much like New York’s subway system, would presumably be here to stay for many, many decades. Who can really say how many people will ride the train in the decades to come? Cleaner electricity seems to be the wave of the future and it doesn’t seem an impossible task to reduce greenhouse gas emissions from construction. One final thought: In the last round of numbers I could find on government websites from the early 2000s, airlines in the U.S. accounted for about 10% of greenhouse gas emissions in the United States and in 2007 about 60% of greenhouse gas emissions came from private vehicles, according to the U.S. EPA. Thoughts on this? Email us at thesource@metro.net.